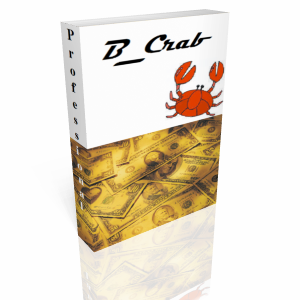 I am glad to introduce you to a professional trading advisor for forex B_Crab. Advisor has excellent fighting characteristics and is ready to fight for your deposit on any battlefield for obtaining the maximum profit. Decisions on transactions Advisor uses the original trading strategy based on the analysis of prices and the RSI indicator. At the time when the indicator shows the equilibrium value of the price, the adviser puts deferred limit and stop orders. The advisor is able to specify the properties of the volume of orders in the amount put up to 10 pieces. This allows more flexibility to set up an expert to trade using a variety of techniques for currency pairs. As a flexible settings allow you to set the advisor on almost any currency pair, CFD, metal or index simultaneously. Testing of history shows that the adviser is successful test in almost any trading instrument since the beginning of 1999 to the current time. And special subsidence is observed. Note that when testing is used almost identical to the input parameters of a trading robot, which means that it is optimally suited for virtually any trading in financial instruments. Also note that the test results are not fitted, and are equally effective on any test site. Unlike "testernyh Grail", the adviser shows real rates of return over the long run. Perhaps the only complex advisor test site appeared the crisis in 2008, which was the biggest drawdown of the deposit, but the rest of the stable income. The expected return of 30% per year. Taking into account the work on multiple pairs can yield much higher profit. When configuring the advisor for short periods of time can raise the annual yield. The product package includes the expert himself and description of settings. All newcomers opened the account for the link http://www.forex4you.org/?affid=3d08d43 assisted, if necessary, or advice. All updates are sent to customers free of charge !!! I also recommend to get acquainted with all my products!